Jeff Galloway is a legend in the running world. He is a world-class athlete and a member of the 1972 US Olympic Team. 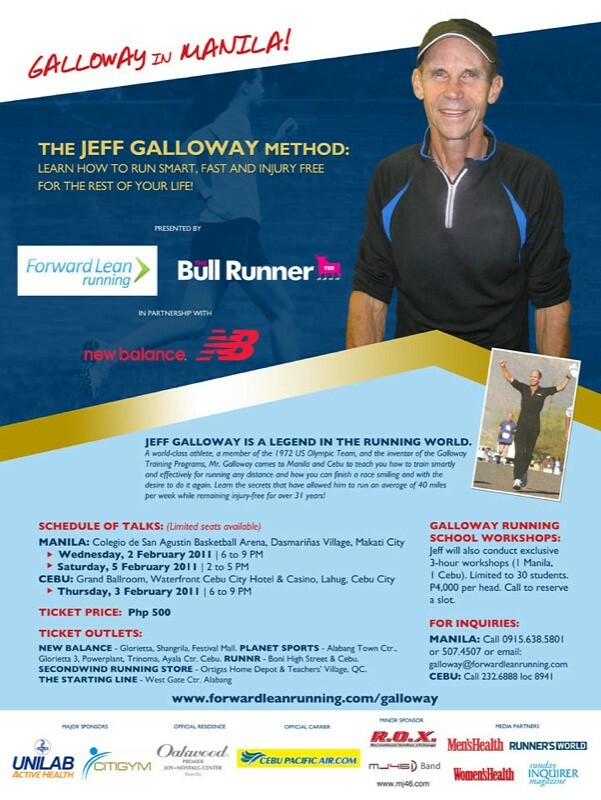 He is the inventor of the Galloway Training Programs and has coached over 250,000 runners and walkers all over the world. Jeff has completed over 130 marathons and has written 18 books on running, walking and general fitness and speaks at over 200 events annually. He has been named one of 18 Runner’s World Experts in the magazine’s 40th anniversary edition. An extensive Q&A follows where Jeff will answer all your questions based on data gathered from coaching over 250,000 runners and a running career that spans nearly 50 years! * Note: Come in your running gear! It’s like Fra Lippo Lippo and their Feb. 13 concert. It’s like Justin Bieber invading Cebu. It’s like Toto or Air Supply or Trini Lopez or Michael Buble landing in our city to do concerts. For runners, this concert is tonight. No, this 1972 U.S. Olympiad does not sing—or maybe, he will—but what he does is sing praises to this sport that has got the Philippines sweating. The sport is Running and the artist is Jeff Galloway. Tonight—from 6 to 9 P.M.—he will be speaking at the Waterfront Cebu City Hotel and Casino. Who is Mr. Galloway? He is a world-class runner whose personal best includes a six-mile (10K) time of 27.21. Back in 1973, he broke the U.S. 10-mile record with a time of 47:49. These days, he coaches, having spoken to “over 200,000 runners and walkers.” A columnist for Runner’s World and a best-selling author, he is one of the world’s most famous gurus of running. Tonight’s “concert” has an entrance fee of only P500. Considering the learnings you and I will absorb—including tips like “conquering the Wall,” “dealing with injuries,” “Cross-training,” “Nutrition: what to eat,” and his famous “Run-Walk-Run” strategy—this ticket price is a bargain. See you! I joined the 5th University Run at the Cebu Doc campus in Mandaue the other weekend and, two mornings ago, the Aboitiz Race To Reduce Challenge 2010. Safety? 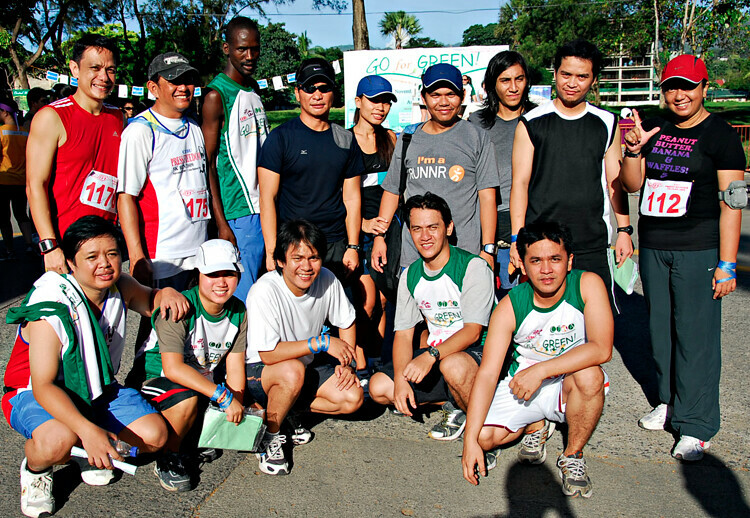 To me, the Cebu Doc run is the safest. Located around a loop surrounding the campus that’s blocked from vehicular traffic, this route is ideal. Same with Aboitiz: I noticed plenty of marshals and policemen manning the intersections of the 21K. Kudos! UNIV. RUN. Here are more good points: The personalized bibs. This was a first. Imagine your name (“SIMON”) pasted on your chest? Two, providing participants the choice of either a singlet or shirt. (I suspect many of us have a foot-tall pile of singlets at home.) Three, Nature’s Valley and Fit ‘N Right food/drinks at the finish. Needs Improvement: The bib. While personalized was unique, the use of paper as material was a mistake. In my case, after only 10 minutes of sweating, the paper succumbed to what paper succumbs to whenever mixed with water: it crumbled. Two, late start. While the race started on time at 6 a.m., I believe (for 10K and longer races) a 5:30 or 5:45 start is better—there’s less sun, less suffering. Three, an estimated 3,500 participants joined—many Cebu Doc students. But, as you know, their 3K was a 3K Walk. And so, runners couldn’t run straight but had to zigzag, weave, snake-run. ABOITIZ. The Good: Timing chips. Two, the Sun.Star advertisement—a first! I’m sure every participant bought a copy yesterday. Three, the presence of Monchu Aboitiz. When I arrived before 5 a.m., the Aboitiz CEO was there. How many leaders are willing to disrupt their Sunday morning sleep to join? Same with Txabi Aboitiz. Which brings me to the weather. Said Txabi in our brief chat after the race: “We asked for the rain to pour at exactly 3 a.m. just before the run!” Yes. At 3:30 a.m., just an hour-plus before the start, rain drenched Cebu. But, as God planned it all along, the downpour cooled the road, readying the asphalt to be trampled upon by 2,500 pairs of shoes. We ran in perfect weather. More good points: the masseurs who softened our stiffened leg muscles (for free)… the instrumentalists on-board a pick-up that moved around the route to regale us with reggae music… the flat/fast course… the breathtaking sunrise view along the SRP at 5:40 a.m… the sponges to cool our overheating bodies… the fire truck near SM that sprinkled water… these were super. Improvements: First, the race pack, which contained no route map. 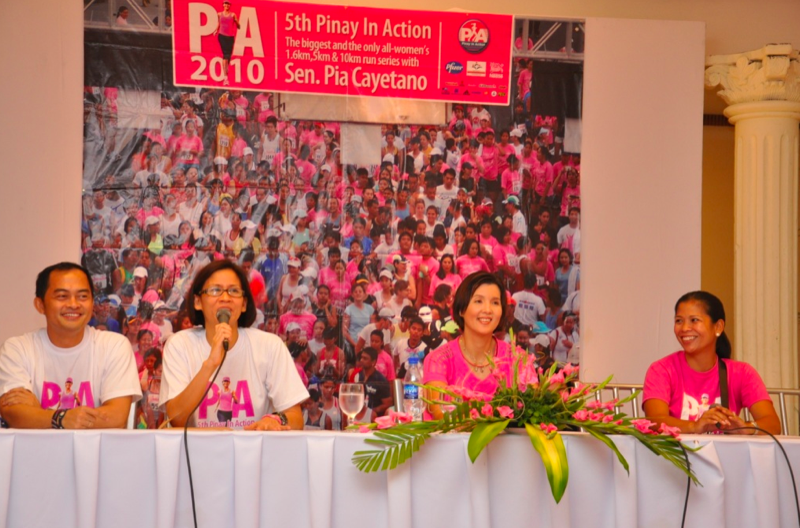 (I had to scour through the Aboitiz website the night before.) Two, the late start. Advertised to begin at 5:15, we started at least 15 minutes late. Three, no countdown. 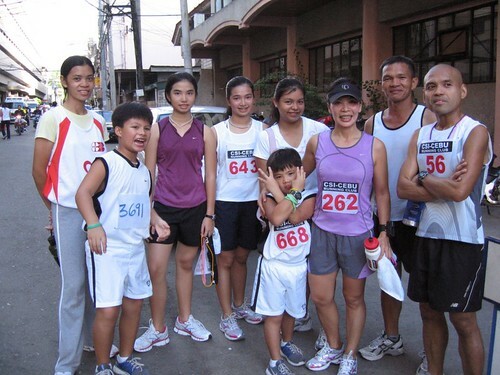 With my companions at the starting line—Michelle So (now a certified half-marathoner! ), Roy and Dr. Rosan Trani, Joel Garganera, Dr. Albert Santos, Dodong Sulatre—we waited for that adrenaline-inducing announcement: “ARE… YOU… READY?! TEN… NINE… EIGHT…” Instead, we were startled when—bang!—the gun fired without warning. Four, no kilometer markers. (To race organizers: why not have one set printed then reuse them for each race?) Five, no clock at the finish. I did not wear a watch because I planned a relaxed run. At the finish line, I looked up to check my time—but there was no clock. Then I asked the people at the finish… nobody knew. Finally, I discovered my time yesterday—thanks to that two-page Sun.Star spread. Excellent article today by Michelle So. But, like any fever, when the temperature’s too high, there’s a problem. And there is a problem: the date “August 15.” The dilemma? Two events are scheduled on the same morning. 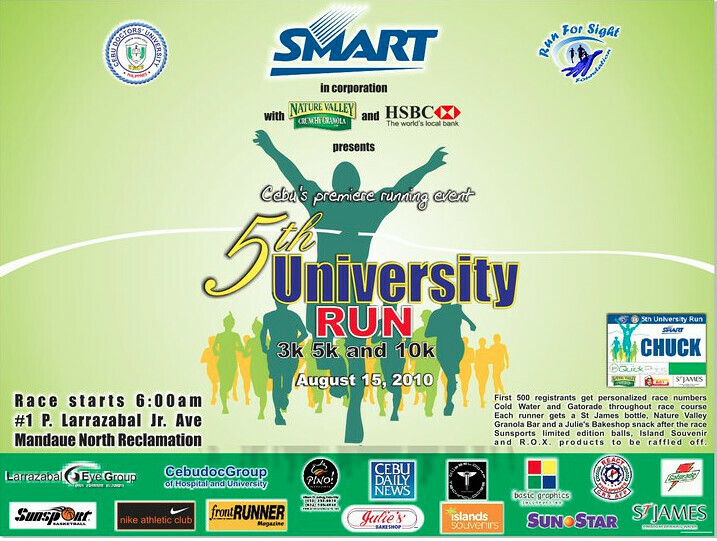 The University Run is on its fifth year. 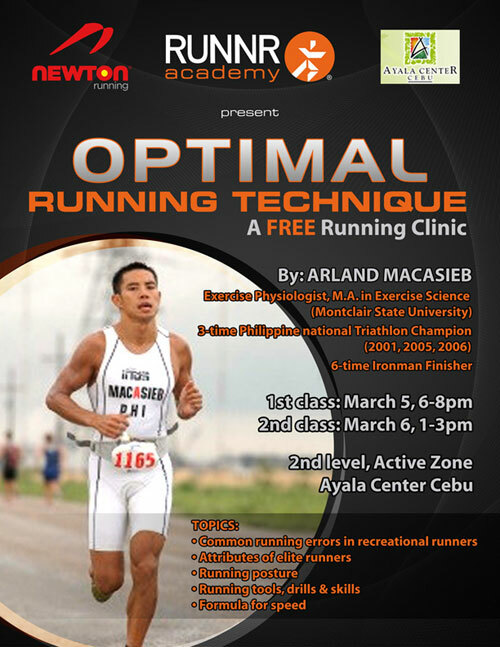 Founded by Dr. Yong Larrazabal, Cebu’s most popular running man, it will draw thousands to the CebuDoc Mandaue campus on Aug. 15. 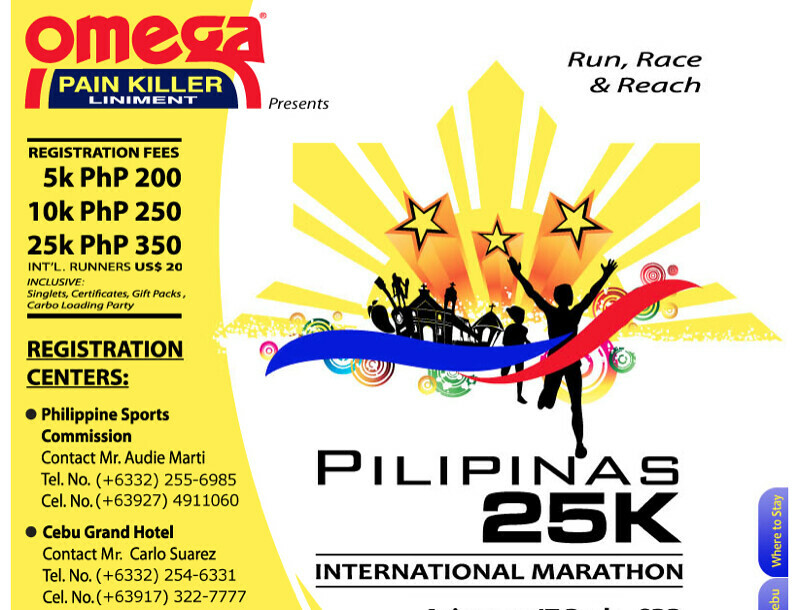 Enter the Pilipinas International Marathon (PIM). Organized by the pharma giant IPI, it features, among others, the unique distance of 25K. It’s date? Aug. 15. Without question, the 5th University Run, an institution of an event, was announced first. But here’s the problem: The PIM organizers did not know about the conflicting schedule. When they approached the Cebu City Hall, checked on Aug. 15, they were given the go-signal. Why? Because the Univ. 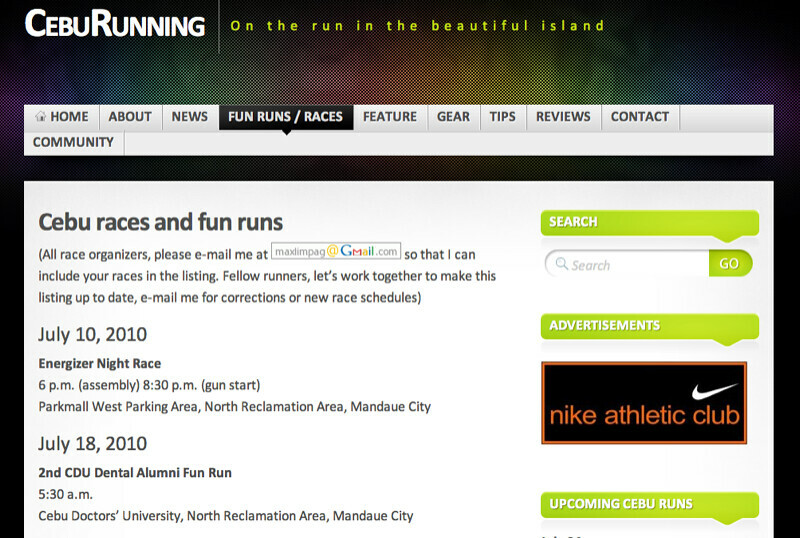 Run is in Mandaue—which, obviously, does not coordinate with Cebu City. I know Tito de la Merced of IPI. I know Joe Deresas. And, in my analysis, their August 15 scheduling was done in good faith. Simply, they did not know another event existed on the same date. Now, what to do? The best solution would be for Mr. De La Merced to move his schedule. Why? For one, after several “bad press” articles “boycotting” the run, this act will evoke such goodwill that thousands of Cebuanos—believe me—will run and embrace the PIM. 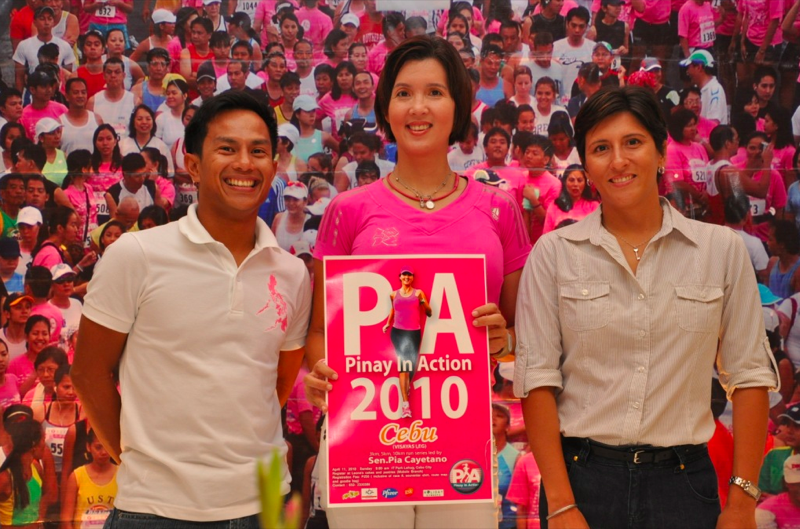 Two, on August 22, it’s the Aboitiz “Race To Reduce” event. It has a 21K distance and, given that timing chips are included, this will be in major conflict with the PIM. (Runners will choose only either the 21K or 25K.) 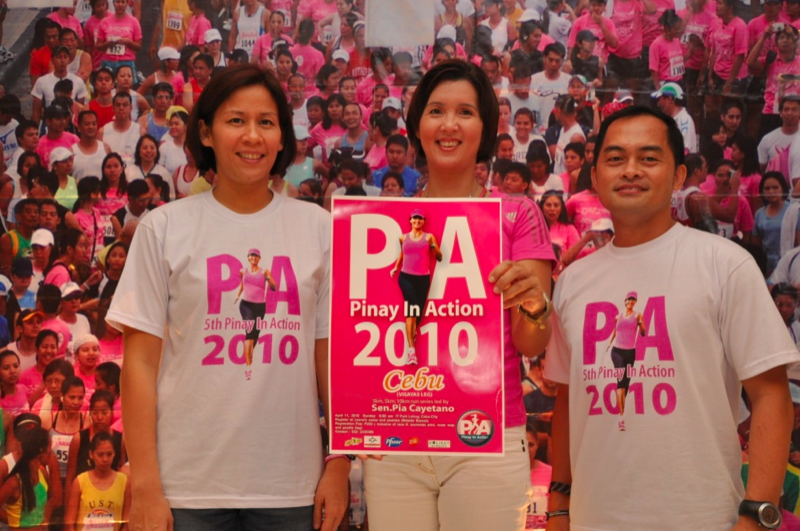 Three, rescheduling the PIM to, say, September or October, will be the perfect long-run event for those joining the Cebu City Marathon on Jan. 9, 2011. An open system. An avenue where organizers and runners can visit. 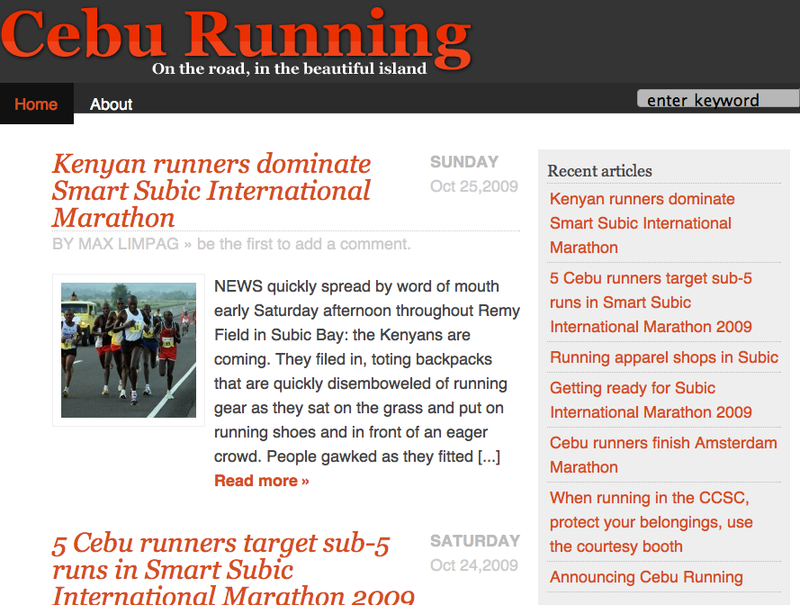 I propose we make a website—www.CebuRunning.com–as the go-to venue. Organized by Max Limpag, my fellow writer/runner, he has a category labeled “Fun Runs/Races.” I suggest that everyone check on this calendar. If, as organizer, you’ve picked a specific date, fire an email to maxlimpag@gmail.com so Max can post your event. Simple. This, of course, does not guarantee exclusivity. If you’re the first to post, it doesn’t mean others can’t organize on the same date. But, at least, the problem IPI faced—not knowing the full calendar—will be addressed. Another tip for organizers? Plan early. Six months lead time is ideal. Also, setup a website. And, announce, announce, announce! Cebu is one happy family. Let’s keep it running that way. The most popular sport in the Philippines today, Cebu included, is not basketball or Bata Reyes’ game or football or Manny Pacquiao’s sport, it’s the one that you and I and tens of thousands of others perform at 6 a.m. in Abellana or late evenings at the Asiatown I.T. Park, it’s the one sport that has convinced many a Saturday-night-partygoer to arise at dawn on Sunday to wear shorts, to tie those shoelaces and to run. Has there been a drug that’s more addictive than running? A sweat-inducing activity that’s invigorated 61-year-olds and hardened 16-year-olds? A sport that has coerced thousands to enlist last Sunday, this Sunday, and next Sunday to join 5Ks, 10Ks and 3Ks? A routine that’s habit-forming, strolling inside RUNNR in Ayala or Mizuno and Nike Stadium in SM each time we step inside the mall? I’ve seen badminton flourish. I’ve observed golfers enlarge in numbers. I’ve witnessed footballers multiply among the elementary students. But, compared to today, they’re nowhere as near as the multitude of runners and the frequency of events held (often twice) on Sunday mornings. What’s different with running is this: It’s free. The air is free, the cement road is free, the friends you run with (unless you make bangka after each run) are free for you to enjoy. This is an inexpensive sport. Running is also this: it’s social. It’s the Facebook of sports. When you run with your barkada, they run beside you. The more you group together, the more you run; the more you run, the more friends you meet, the bigger the social network. Running is the best way to lose weight. This is a fact. No other sport burns more calories than throwing your weight forward, one leg in front of the other at a time. Best of all, running creates… Momentum. Like everybody else, when you start, you gasp for air, your muscles ache, your first-ever 3K run is painful. This is normal. But, if you keep on pushing, you’ll soon realize that 30 minutes is a cinch. Then, 40 minutes is effortless. You progress. A 5K run? Ah, you say, kaya ra! After… you do the distance that you never thought possible when you started: 25 loops around the oval of the Cebu City Sports Center. That’s 10 kilometers. For beginners, I can never run that far, is the thought. But, as you progress — as one gains Momentum — the 10K test is passed. So herein lies the secret of running: You target farther… and target farther… and farther… from 3 to 5 to 10 to 12 to 16… the next thing you realize, after six months, you’re aiming for that 21K. Which brings me to the ultimate distance: 26.2 miles. It’s called the Marathon. And, by this term “marathon,” I don’t mean, like others say it, “I’ll run a 5K marathon!” That’s incorrect. The marathon has one unique number: 42.195. That’s in kilometers. And every runner, even if you’re just a 3K Fun Runner today, should aim — at least once in your life — to complete a marathon. That’s true. I’ve ran three marathons and finished only two; in my first, in Hong Kong, I succumbed to cramps and knee injuries. And so, to attempt a 42K run — the distance from Capitol to Carcar — one must prepare. And seven months preparation time, even for one who’s a 10K finisher today, is sufficient. How to train? I’ll save that for a future column. But, for now, the challenge is before you: See you in January. If golf has The Masters and tennis has Wimbledon, running has The Boston Marathon. It is the oldest (next week is the 114th edition) and most prestigious of all 42K races. From Cebu, no female runner has ever joined Boston. The reason? The qualifying time (based on one’s age) is ultra-tough. Millette Chiongbian is the first! A lifelong fitness buff, she started running less than three years ago. Qualifying for Boston? 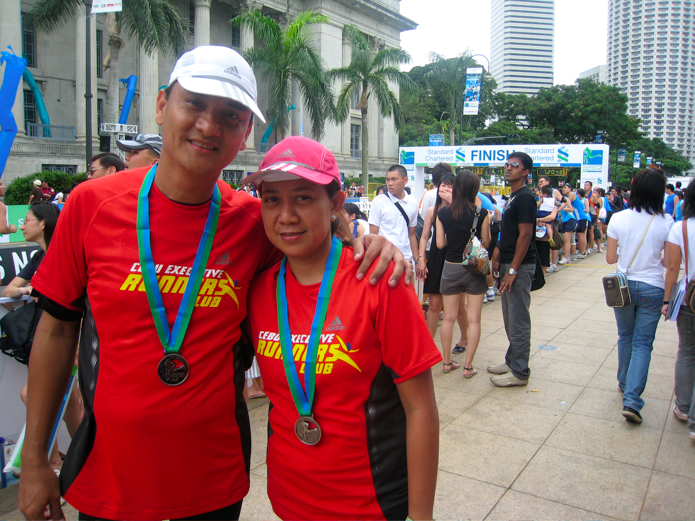 This was Millette’s dream two Decembers ago when she joined the Singapore Marathon. Sadly, she missed the 3:45 cutoff time by three minutes! Then, last March 21 at the Los Angeles Marathon in California, Millette, never one to give up, made a second attempt. Her time? 3:43:06! Here’s Millette’s story…. “Yes, I did it! And I am truly happy indeed. 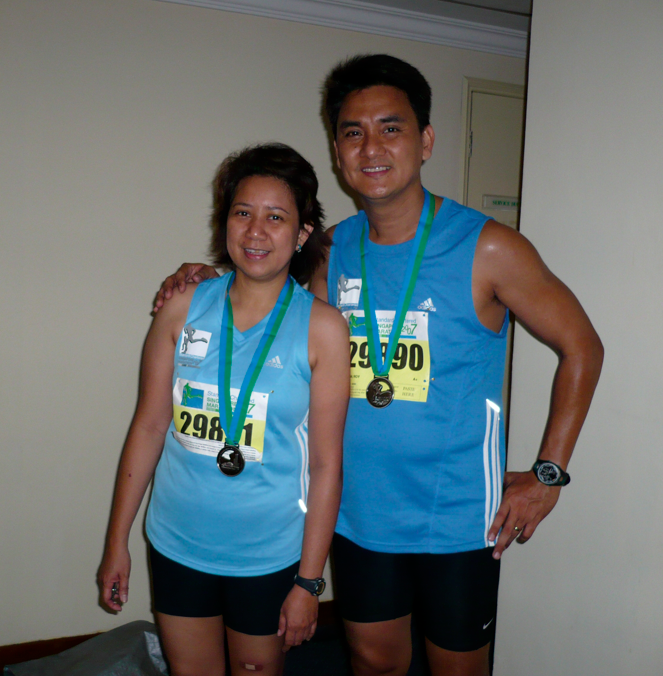 2008 Singapore Marathon was a trying one for me. Equipment failure and premature cramping on the 12th K were directions toward a disastrous event. Still I crossed the finish line at 3:48 which was three minutes shy from my goal. But the kicker was when I was posted DQ. I remember to have called you immediately while Frederic and Chris analyzed the DQ stats. I shrank in my unexpected omissions of a runner. “March 18 2009. Orthopedist’s prognosis of a total hip replacement extricated me from the Singapore Marathon’s DQ queasiness. Despite my doctor’s “It will take a miracle to reverse the necrosis on the femur head,” the possibility of running on metals didn’t thwart my devotion to carry on the Boston pipe dream. “Sidelined from running between March-July 2009 was the most human part I and Fredric ever came close to a “shortcoming.” In truth, miracles happen. Being pain-free by November 2009 caused me to browse AIMS. “LA is home to my mother’s family. Chris (Aldeguer) expressed a good opinion on the variables of the race venue as well. I formally got into the standards of training on November 2009. Training with Coach Bert Banzon is never casual. Every key workout had to be an abstract component to the Goal. 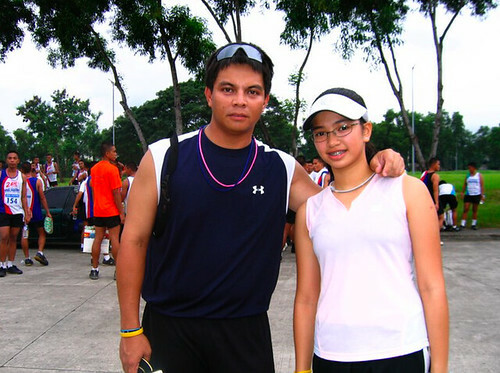 I train with Coach Pio Solon for strength and conditioning whose goal was to get me pain-free and strong in meeting the rigors of training and racing. To reason, I find this science a binding force. At times, my necrotic hip would be on drama enough to stagnate the progression of training. “I ran 6-7 times weekly and apexed at 120+ kms./week just weeks prior to March 21’s race. I made it a point to join half-marathon races to get coordinated with the training paces of my marathon program. 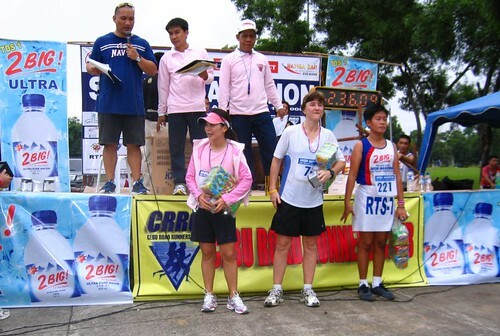 And these races were: QCIM 10/20/09 PR 1:45 12th women overall, 1st age group divsion; Cebu City Marathon 1-10-10 PR 1:43:54 4th women overall; Condura 2/07/10 PR1:45 (21.800km); Century Tuna leg1 PR 1:43 8th women overall. These progressive best times validate the specificity of my run and strength programs. “The 2010 LA Marathon was timed using both bib number and the B-Tag Timing System. The B-Tag is attached to the backside of the race bib and this timing uses the ChronoTrack Timing System which allows anyone to track runners’ splits on the route. “Advised by the organizers to be at Dodger Stadium at 5:20 a.m., it was then between 10-12’C at that time. Bright lights, Jumbotrons and thousands of runners filled up the stadium seats. I felt like I was going to a baseball game. After warming up concisely I then headed towards the sub 4 hr. corral. Pace per mile signs were hung along the sides of corrals. It wasn’t as chilly as I expected it to be despite being overcast but I still had my mitts on and another top layer. Several runners were layered up in what looked like trash bags? “At 7:24, the gun went off for the wheelers followed by the hand cycles, elite women and the last, elite men and the full field where I was at. Keeping a visual on the Clif Bar 3:40 pacer most of the time, I still ran my own race. The balloons would re-appear often. I found the 3:40 pacer aggressive on the descents. The start was off to a climb for 800m. It was akin to the Century Tuna leg 1 course with spiky undulations all the way to km 37 then a downward slope to the finish line at Santa Monica Pier which records this route to be a fast course. “I was in control. I had full clarity and was focused but i didn’t spare myself to notice and appreciate the entertainment along the course which was spiced up with live band entertainment centers, city block parties, cheer alleys and thousands of volunteers. Mile markers with race clocks, hydration and medical stations by California Hospital Medical abound along the course. Two pain relief zones past mile 18 and at the finish line were apparent, too. “I was hopeful that events will be favorable until my knee caps howled at km 28. Tipping the doubt scale on the recognition of perceptual cramping cues, I wasn’t free from doubt at all for we all know the real marathon is on the last 10K. To accept a greater effort by pacing up, by hydrating more and dissociating myself were the tricks that freed me from the cramp. To MILLETTE, who’ll be running the 2011 Boston Marathon…. CONGRATULATIONS! 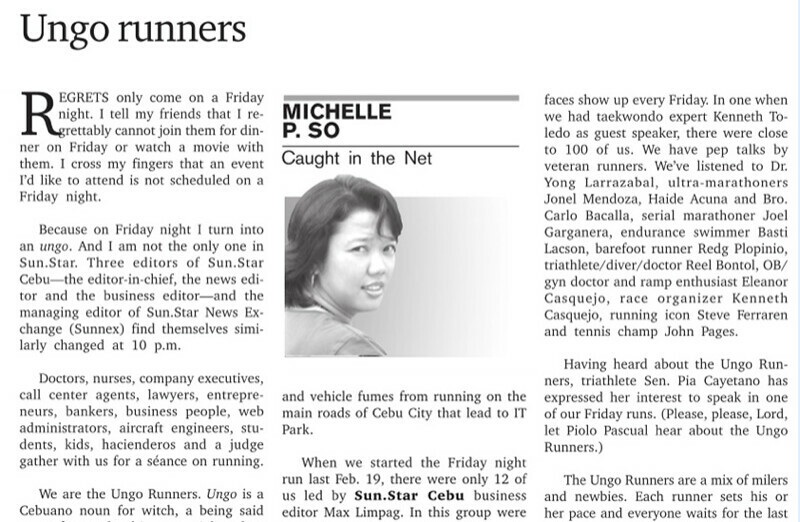 I wrote this article last Dec. 2, 2008…..
Mrs. Chiongbian is one of Cebu’s top female executive runners. The podium? After the race? Where the winners are accorded medals? She’s climbed on top of those—aplenty. 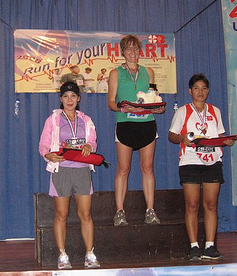 She’s done the 2006 Sinulog Marathon, where she ranked 8th. At last year’s Milo Half-Marathon, she placed 5th and outran one of RP’s most famous long-distance runners, Senator Pia Cayetano. This 2008 edition of Milo? She bettered herself, placing 3rd. But among the many trophies that adorn Millette Chiongbian’s home at Maria Luisa, nothing compares to the training she’s devoted on an event that will race five days from today: the Standard Chartered Singapore Marathon. For nearly 12 months, Millette has spent her early mornings and late afternoons running, covering over 100 kms. per week. Imagine that: nearly 500 kms. of running per month! I bet—for comparison’s sake—that 9 out of 10 people on earth will not hit 500 kms. of combined running their entire life. What a Reader’s Digest quotable quote. To a fellow runner like myself, those words are genuine, profound, honest. A fitness extremist who’s done cross-training sports for 22 years, badminton for six and triathlon for 24 months, Millette is comparably new to running. Although she did leisure jogs before, she only entered serious running last June 2007—about 1 ½ years ago. But since she’s started—given the athletic zealot that she is—Millette has run mile after kilometer after mile. In fact, on one occasion relayed to me by Chris Aldeguer, a fellow runner who’ll compete at the Las Vegas Marathon this same Sunday, Millette did the most inconceivable of acts: She ran on a treadmill…. for five hours! Oh yes, she had to stop—but only for a few seconds because the poor treadmill had to restart after Millette’s non-stop poundings. In all, she ran a full marathon (42-K) on that rotating belt of a machine. Incredible? That’s a synonym for Millette. This Sunday’s 2008 Singapore Marathon? Billed as one of Asia’s biggest road races (50,000 pairs of sneakers will compete in the 10-K, 21-K and 42-K distances), when I asked Millette for her expectations, she replied, through e-mail: “I have prepared for this for about a year… I believe am at my strongest. Will definitely run this race faster than my 1st,” referring to the ’06 Sinulog Marathon when she clocked four hours, 40 minutes. Given her six-days-a-week training program with one of Cebu’s top coaches, Elberto Banzon, Millette is expected to perform well—and possibly emerge as the fastest runner among our 28-person Cebu delegation. If all conditions are right, Millette’s ultimate goal would be to clock 3 hours, 45 minutes and qualify for the most prestigious race on earth, the Boston Marathon. For, with Millette, running is simple. Fun. Easy. Just don’t ask that treadmill who suffered a five-hour hammering. If you think running 42,195 meters to complete a marathon is ridiculous, meet Bro. Carlo Bacalla. He’s no ordinary marathoner. He’s an ultra-marathoner. And, last March 7, he joined a race that’s the farthest in distance: the Bataan Death March (BDM). How far? One hundred two kilometers. Training director of the Don Bosco Training Center for out-of-school-youth in Pasil (among his myriad of jobs)–that’s Bro. Carlo’s profession. His passion: running. At the BDM 102K race that spanned from Mariveles, Bataan to San Fernando, Pampanga, a total of 142 registered (including Haide Acuña). In the end, only 104 finished. Bro. Carlo? Did he make it? No. I mean, No, he didn’t just make the cut… he finished 17th place! An outstanding achievement (clocking 14 hours and 38 minutes) for one who’s 47 years old. 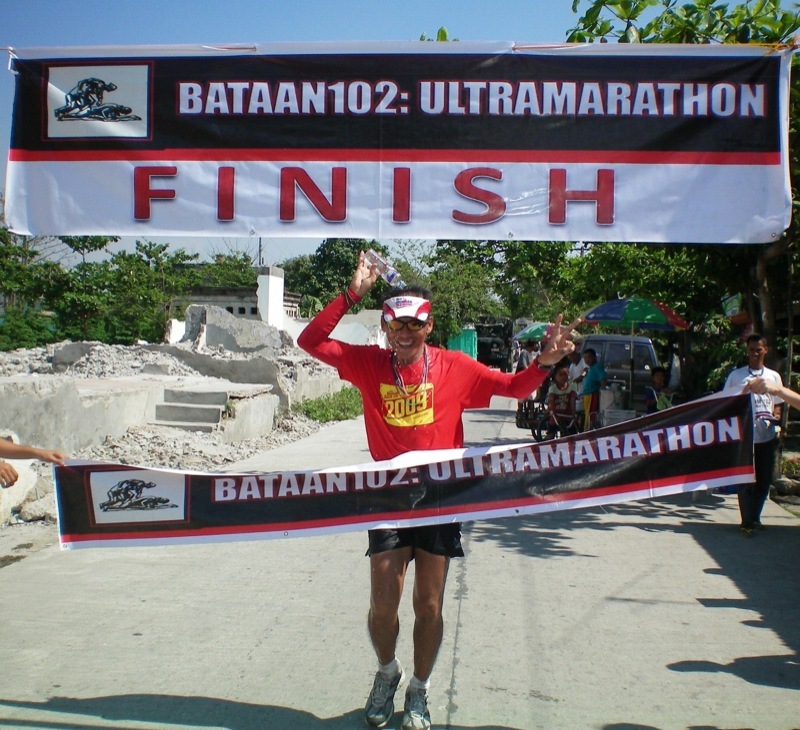 He has completed nine marathons–plus the Ironman race last August in Camarines Sur. Why run 102 kms.? Only the most hard-core of men who can absorb pain, even relish it, attempt the distance. And that’s Brother. When we were kids I remember joining “poste-poste” races in our neighborhood. We would bet on empty cigarette cases that we would fold like peso bills. It was our past time then. My first official run was in 1986 in the 10 k freedom run at EDSA. 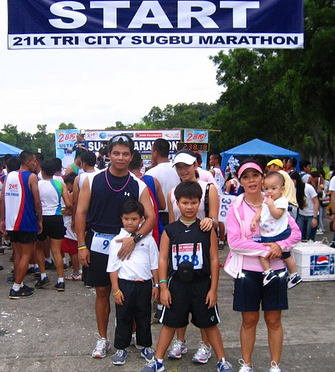 I run my first full marathon when I was a student of theology in Paranaque in 1988. I recall that when I took permission from my rector, his answer was: “Ok you run as long as you don’t sleep in class”. 2. How many marathons have you done? What’s your best time? 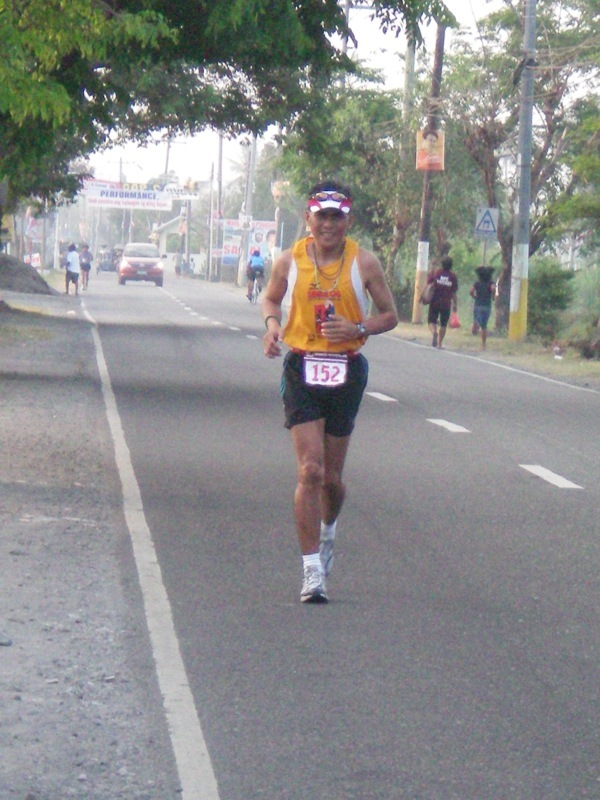 I did my first full marathon in 1988 in the “Pilipinas Marathon” the second was the “PAL Marathon”. I did 3 runs in the former and 4 in the latter. I had to stop running when I volunteered to work as a missionary in Africa and worked for 13 years there. The QCIM was my 8th marathon after 17 years of absence. 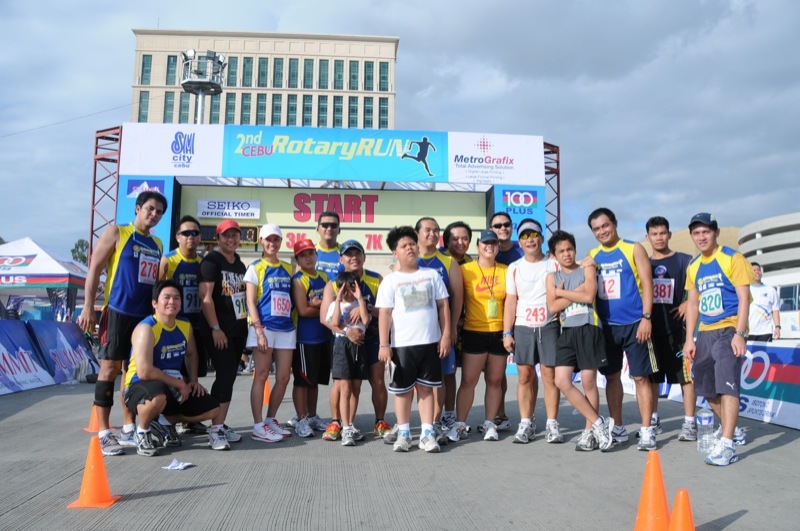 The Condura Run last Feb. 7 was my 9th. My best time was 3:45 in the Pilipinas Marathon. 3. Why run 102 kms? I had no idea about the BDM 102 until January 15 of this year when I was browsing for ultramarathons in the internet. I was interested in the “Famous Comrades” of South Africa but was informed that registration was long closed. Then I came across TNF and BDM. I didn’t like the former because it was a trail run but the latter was closed too since Jan. 6. I wrote a comment to the organizers of BDM and begged that I be allowed to join. On Jan. 18 I got the approval from bald runner and so the serious training of less than 2 months began. 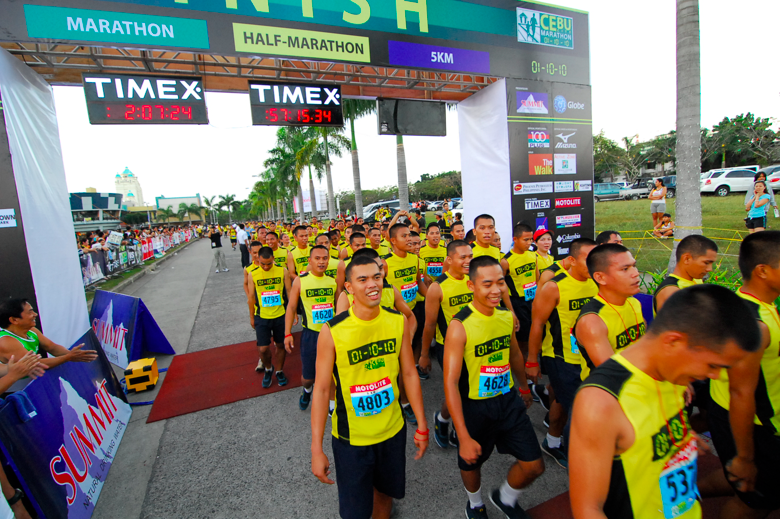 The race covers a distance of 102 km from Mariveles, Bataan to San Fernando, Pampanga. Reason for running? 1. I like challenges and BDM provided one. 2. To pay tribute to the heroes of Bataan, 3. To test my mental and physical limits. 4. To have more photos for Faacebook, hahaha. 4. Describe your entire BDM experience. After reading so much about ultra running, I drafted my own 7-week training program. With barely two months to prepare, I did what I had to do: run, run, run, climb, climb, climb, drink, drink, drink, pee, pee, pee. The Condura Run was my test to determine my fitness for the BDM. I set a goal of 12 hours. I climbed to tops trice, run from Pasil to Cordova and back twice, and did night and mid-day runs 5 times. I did my longest run of 80 km 2 Sundays before the race. After doing my last 2 short runs during the race week, I felt confident I can hit my target. The route was completely unknown to me. Fortunately, a priest-colleague from Don Bosco Pampanga volunteered to drive me and we did an ocular check before race day. It helped me gain more confidence. I had everything ready by noon of March 6. After briefing my support crew, I took dinner and droved to Mariveles, Bataan and met Haide for our planned photo session at km 00. The atmosphere was festive despite the poorly lighted starting area. After taking photos, I had a chat with Haide while waiting for the race briefing. We encouraged each other and agreed to meet at the finish line. The starting gun was fired at 11:30 pm. I made the sign of the cross and took the road. My plan was to divide the distance to 3 the first 42 km in 5 hours, same with the second 42 km, and the final 18 km in 2 hours. But I had to make adjustments in the first part due to the many climbs. Part of the strategy was to run-walk in some stiff climbs. Practically, the second half of the route was flat but due to the heat which reached 41 deg Celsius at noon time, I had to slow down. I instructed my support crew to leap frog every 2 km in the first 6 hours and at every 1.5 km thereafter. I took my drinks and replenishments in those stops. At 10 am due to extreme heat, we had to change strategy and had my support vehicle stop at every 1 km until km 102. There were times when I was tempted to race with the other runners, to go fast at the early part of the race, or to run the uphills. Those were moments of tests and learnings. Right from the start I was confident I will finish the run but I didn’t expect to be in the 17th place. At the end I would attribute ninety percent of the success to my support crew. It would have been impossible to do it without a good support team to provide water and replenishments. We had our support vehicle stuffed with 12 bottles of Gatorade and mineral water, biscuits, power gels, bananas, pandesal, sliced bread, first aid and 2 extra gallons of water. If I counted right, I think I urinated 15 times throughout the entire distance, an indication that I hydrated myself well. I did something unusual at every kilometer post: I prayed to the holy souls of those who died during the death march to help me reach km 102. I crossed the finish line pouring the last drop of water on my head and flashing the v-sign. It was fun with countless lessons. Definitely, I will join the BDM next year. According to the organizers the distance will be extended till Capas, Tarlac where the soldiers ended the death march. That’s a 140 km distance. 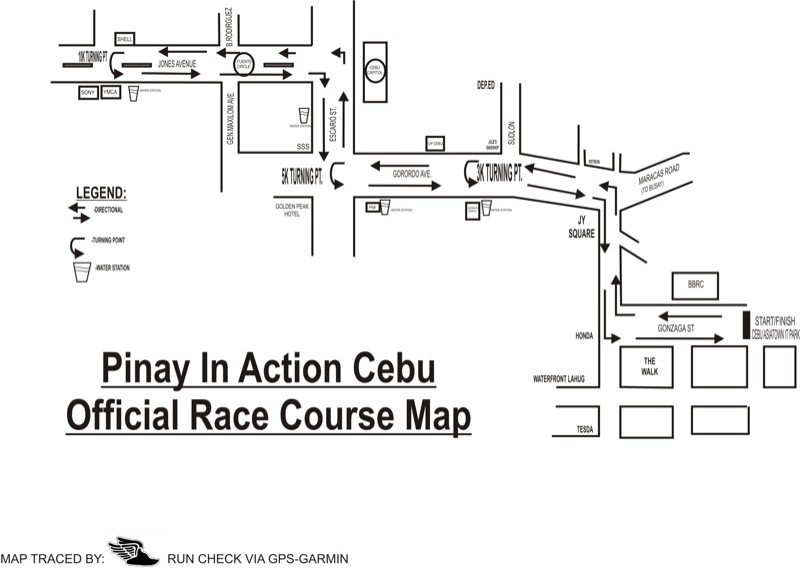 If my schedule permits me, I will try to join in all the local runs in Cebu. But there are invitations for me to play in the 40 and above soccer tournament in Bacolod in May. I will try going back to soccer this summer. This is just for a change. By June I will start preparing for my 2nd half-ironman in Camsur this August 22. Swimming will be my focus this time. I hope to improve my personal time and finish it in 6 hours. In November I will start training for the BDM 2011. Don’t get me wrong ha. Sports is just a past time, it’s not a career. My duties as a religious brother always take priority. 7. What’s your work with Don Bosco? Quite a lot. I am the training director of Don Bosco Training Center for out-of-school-youth in Pasil. At the same time I am in-charge of the alumni of the same center. At the provincial level (salesians of don Bosco in Visayas and Mindanao) I head the commission on missions and work as the coordinator of the salesian lay volunteer organization. I am the chairman of the Visayas Association of Religious Brothers (VARB) and the national president of the National Federation of Religious Brothers of the Philippines (NFRBP). With such amount of work, I really have to juggle with my running and my duties. I would even run at very ungodly hours so that I can be back for my community prayers and other duties. 8. Did you run in Africa when you were assigned there? I was 13 years in Africa but I didn’t run much because the place where I worked was not running-friendly. I had an overdose of soccer in Nigeria. However, I did organize fun runs in the two centers where I was assigned. In 2005, I run a half-marathon in Lagos. 9. If you don’t mind, how old are you? Age is a state of the mind! My chronological age is 47 (28 years as a religious brother) but I put 25 as my age in my Facebook, hahaha. That all changed last weekend. 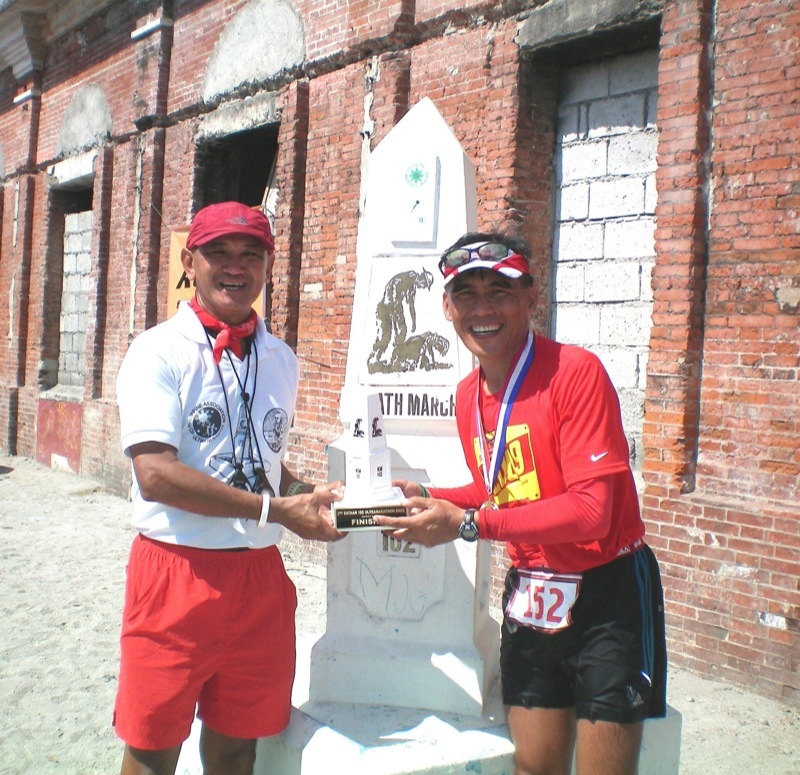 Mendel Lopez, who was previously the Simon Losiaboi of Cebu before Simon Losiaboi arrived, joined the Ramon Magsaysay trek called “Paghandum Ni Magsaysay.” Beside Mendel, who had just arrived from Hong Kong and won third place in the 21K race, was his forever-nemesis, Simon. The gun blasted in Balamban. The runners sprinted not on flat asphalted road but on steep uphill terrain often littered with pebbles and dirt. Lopez beat Losiaboi. Again. Dili taghap. This is amazing. And thrilling. It’s like a movie we enjoyed so much that we can’t wait for Part 2. Which brings me to ask: Who’ll win in Part 2? 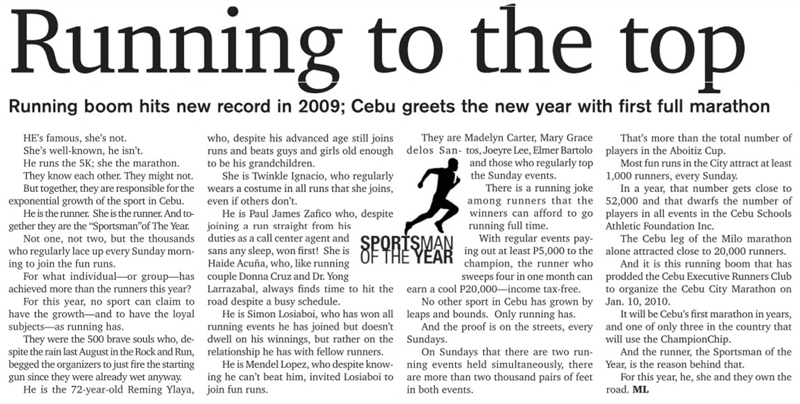 Will Mendel, looking extremely lean when I saw him two weeks ago as our awardee during the 28th Cebu Sports Awards, with his renewed confidence, strive harder, run even faster, and continue to beat Simon? Or was that a partial taghap. Since Mendel trained, in the weeks before last weekend, up hills and mountains to prepare for Hong Kong, was he better conditioned for the vertical climb? And when they return to flat ground, will he succumb to the silver medal? Maybe not. Maybe. Or will Losiaboi, having tasted the sour taste of defeat, fight harder, train not twice but thrice daily, eat even less and become thinner than a bamboo pole, reclaim his gold? Abangan. Some prefer a candlelight dinner in Shangri-La. Some “say it with flowers.” Others lavish their spouse with a tiny box, inside of which is a stone that glitters. Some opt for a kiss and an “I love you” whisper. Others, a picnic in Tops or, as our governor herself joked, a stroll inside Plaza Independencia. Roy and Rosan Trani, two of my closest friends the past three years, prefer a different version of February 14. This Valentine’s Day, they’ll awake at 3:30 a.m. to spend the next waking hours together. Two feet apart. Two feet bouncing. Running. Roy, 48, and Dr. Rosan, 46, have been married for 22 happy years now. One “success formula” they’ve employed in their love-life is a simple yet proven technique that all of us should emulate: The weekly date. Roy spoke of their schedule. 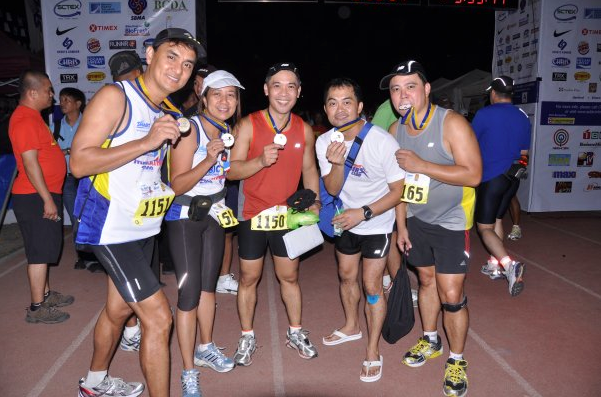 “Since we started running together and with our friends in CERC (Cebu Executive Runners Club), we always start our Sundays with early morning runs at 4:30 a.m… doing 10k to 21K, from 1.5 to 2.5 hours. 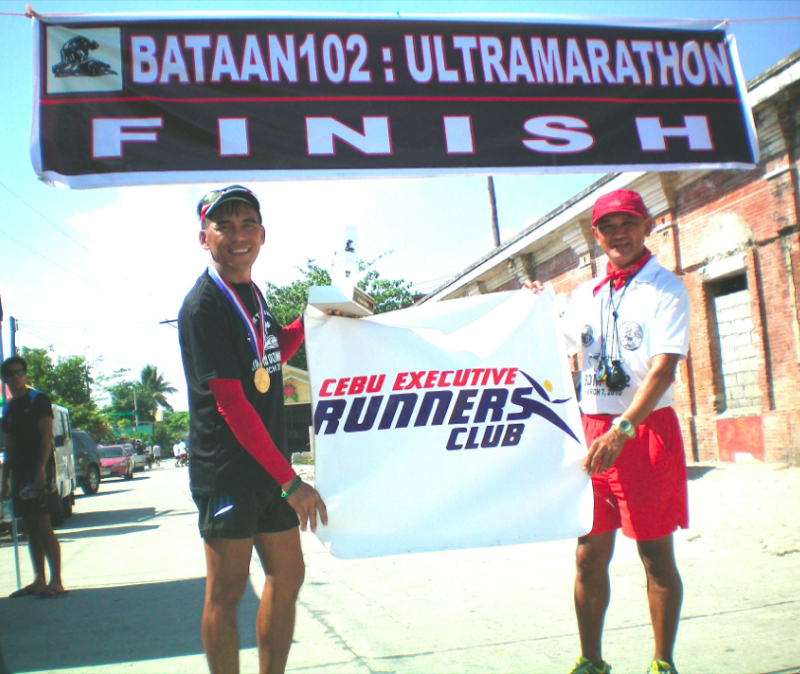 We run just about anywhere in Cebu, Mandaue, and Lapu-Lapu,” he said. “We don’t usually talk while running. 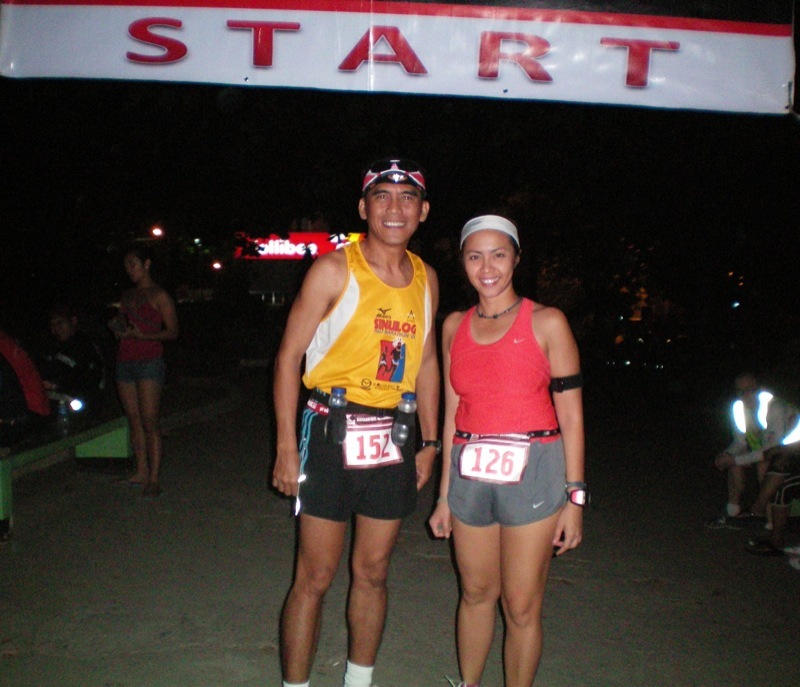 Last year in the Subic marathon, we prayed the rosary together, especially when we passed the ‘dark roads’ in SCLEX. We just feel comfortable, ‘peaceful’ running together. It’s good to know that even during this kind of activity, your spouse is with you. Running at the same pace, in the same direction, helping each other cross the finish line. Read Mike Limpag’s excellent Sun.Star piece here. If you’re a runner, I suggest you visit one store this weekend: RUNNR. Yes. A runner inside Runnr. No, I did not misspell the word. 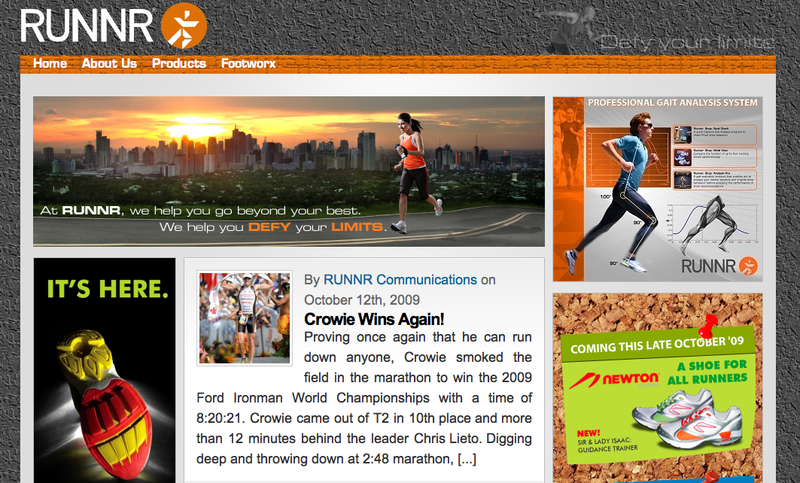 RUNNR, the newest addition to Ayala Center Cebu’s mix of sporting goods outlets, is spelled uniquely as… Runnr. Located across TimeZone and Sbarro, inside you will find Hammer energy gels, Newton shoes, FuelBelts, New Balance insoles, Polar watches—in short, all things running. By Runnr. Best of all, they have an equipment that’s computerized and is the only one of its kind in the Visayas and Mindanao: the Professional Gait Analysis System. Called “Footworx: The Science of Running,” you are asked to run barefoot on a treadmill (yes, running inside the store!) while high-speed video cameras capture your stride. The purpose? Your foot type is scientifically determined. The end result? You’ll be able to purchase the shoe type that’s perfect for your unique feet. The best news about this Gait Analysis? RUNNR offers this for free! No gimmicks where you need to purchase P500 worth of items before you step on the treadmill. No. You enter RUNNR and can try it for free. Toby Claudio, the owner of the sporting goods conglomerate whose store name is derived from his first name—“Toby’s”—was the man who, recognizing the popularity of running, conceptualized the new store and opened it in Boni High Street in Fort Bonifacio last June. And, just last Saturday, Toby opened his second branch in, where else, our own Cebu City. 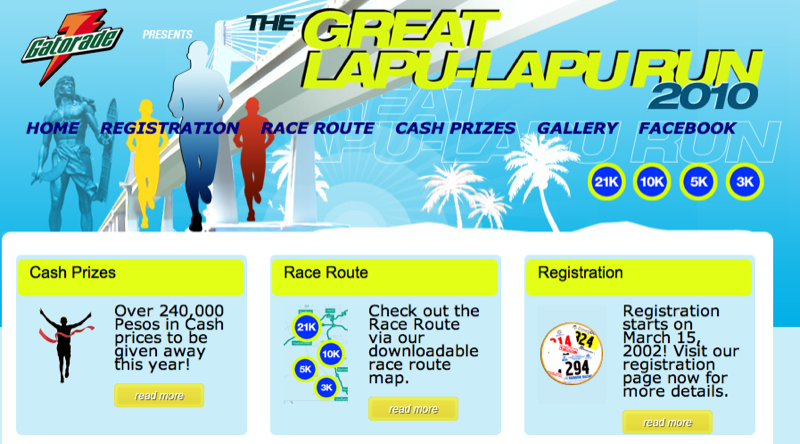 Congratulations to my good friend and fellow writer/runner, MAX LIMPAG, for his new website that caters to this growing and popular sport in our beloved island….